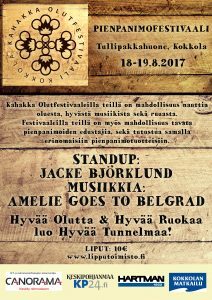 Kahakka Small Brewery Festival has now been arranged two times in Kokkola since 2017. The two day festival cultivates the local brewery tradition and celebrates the ongoing, never ending innovation process aiming for ever better beers. The second, year 2018 festival was already a great success measured by the amount of guests who enjoyed the premium products of seven small breweries mainly from Kokkola district, some from farther away. Good food and music were also generously served. As the stage of the event has served the old, historically valuable and pictorescue house of Tullipakkahuone. Moose On The Loose Brewing Co.
Have a sip yourself, take a look at Kahakka web site here.